As was recently reported, state senator Jeff Brandes asked the FDOT to investigate how PSTA is spending taxpayer dollars on it's Greenlight Pinellas "education" campaign. The FDOT Inspector General we understand is now conducting an investigation. Since when were yard signs part of an "educational" campaign? Common sense says yard signs are used to advocate and encourage support. These advocacy activities are what the privately funded campaigns are expected to do - not taxpayer funded agencies. 1) Taxpayer dollars are spent on trinkets, including buttons, pens, refrigerator magnets, chip clips, bead necklaces and goodie bags. 2) PSTA CEO Brad Miller speaks at the private Yes for Greenlight advocacy campaign's kick off meeting on PSTA time and dime standing right next to a big sign stating "VOTE YES" on Nov. 4th. 3) PSTA CEO Brad Miller admits he provides a one-sided campaign that provides no "educational" information regarding any cons or negatives about Greenlight Pinellas. He doesn't think he needs to as if there are no negatives to the plan. 3) PSTA hires Tucker Hall - a PR firm. Why are PR firms hired? To influence and persuade public opinion. 4) PSTA spent $400K of taxpayer dollars last year lobbying the Pinellas County Commissioners and targeted groups to get the referendum on the ballot. 5) PSTA plans to spend at least $400K more this year on their advocacy campaign that now includes yard signs. 6) PSTA is using their own bus wraps to advertise (encourage support for) Greenlight Pinellas for which they are not getting commercial revenue. PSTA denied No Tax For Tracks who wanted to BUY their own bus wraps which would be revenue to PSTA. Greenlight Pinellas got lawyered up last year and their lawyers state that as long as they simply do not say "vote for" or "support" - hey its ok to spend gobs of taxpayer dollars encouraging folks to "vote for" the referendum without using those silly little words. Actions always speak louder than words! ...stop state and local governments from campaigning with taxpayer dollars. Unfortunately, courts have essentially read these laws to prohibit only electioneering that “unambiguously” urges a “yes” or “no” vote. As a result, government bodies often skirt the law and use public resources to broadcast one-sided messages about ballot measures. HB 2156 requires government bodies to be truly neutral with taxpayer dollars. Government may inform the public on ballot issues, but publicly sponsored forums or events must be purely educational, with an equal opportunity for the presentation of all viewpoints (emphasis mine). ...close the loopholes on public-resource electioneering bans. If Greeniight Pinellas is not violating the intent of our electioneering laws, they are violating the spirit of the law and making a mockery out of them. It is the responsibility of privately funded campaigns to sell their side. It is the responsibility of the county commissioners, who vote to place any referendum on the ballot, to sell it to their constituents. If the county commissioners understand the referendum enough to put it on the ballot, they should understand it enough to sell it to the voters. It is not the responsibility of the transit agency to use taxpayer dollars to be the county referendum's marketing firm. It is the responsibility of the transit agency to honestly provide the technical information regarding the specifics of the plan. As SaintPetersblog recently reported, PSTA/Greenlight Pinellas should be answering why they continue to show the rail line running along adjacent CSX tracks when PSTA knew since 2012 (2 years ago) that CSX said No. Isn't eminent domain a major issue that must be considered? Did PSTA think they could get away with NOT informing voters they may need to use eminent domain to gain right of way? Eminent domain can cause huge delays and higher costs for any project. After spending $4 million on an Alternatives Analysis, PSTA should have had a solid plan. Do they? What else is PSTA not being honest about? 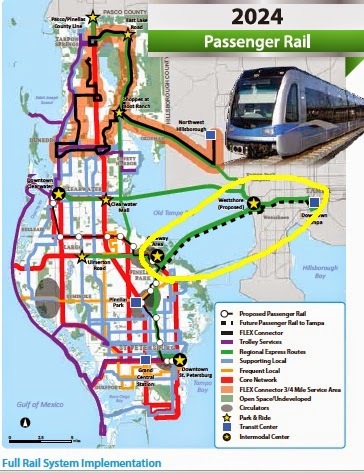 Their map continues to state there will be a future train across the Howard Frankland by 2024. This is a false narrative as the Tampa Bay Business Journal recently reported. It is more likely we will have autonomous vehicles using highly utilized managed lanes before any high cost, taxpayer subsidized train could ever be built across the bridge. Polk County has a transportation referendum on the ballot in November and its transit agency also wants taxpayer dollars for an "education" campaign. Were they watching what PSTA/Greenlight Pinellas has been getting away with? County commissioners will be asked Tuesday to contribute $125,000 toward an educational campaign for this year’s sales tax referendum to fund transit and road projects. The request by Tom Phillips, executive director of Polk Transit and the Lakeland Area Mass Transit District, caught commissioners by surprise when he brought it up during this morning’s agenda study session. Phillips plans to use radio and television ads to promote (emphasis mine) the referendum. But Dantzler said he hasn’t heard a big outcry from the business community about the need for more transit to get employees to work. Dantzler, who is a commercial real estate broker, said, despite what some people claim, the issue of transit service has never been raised by any of his clients looking for property in Polk County. Is Polk County's referendum activity murky too? Is it legal to use taxpayer dollars to air ads that promote a referendum to raise taxes? The Polk County referendum is split 50% for transit and 50% for roads. It appears all the media ads are promoting transit. ...how to use the $50,000 commissioners approved to educate the public about the My Road part of the referendum. Phillips last week asked commissioners for $160,000 to fund a My Road educational campaign, but commissioners, responding to public criticism over spending any money on the referendum, approved the smaller amount. This abuse of taxpayer money must stop or it will be used elsewhere - in our own backyard - in the very near future.